We've designed Windows Live Hotmail storage to grow with you, but at a reasonable pace. That means you should have plenty of storage unless you suddenly want to store the planet Jupiter on Hotmail, in which case we'll send you a nice e-mail asking you to please not try to store planets on Windows Live Hotmail (although gradual storage of moons and asteroids is ok). 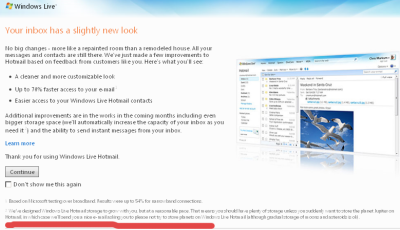 อ่านภาษาไทยได้ที่ Pantip: "คุณค่ะ..โปรดอย่าพยายามจัดเก็บดาวเคราะห์ไว้ใน Windows Live Hotmail"